Title: BNSF 6392 gets closer to me as she rolls west with a loaded coal. Title: BNSF 6392 and BNSF 6096 up close as they roll west with a loaded coal. Engineer waved and blew horn after he passed me :))). Title: BNSF 6392 side shot as she rolls west by me towards Spokane, Wa. Description: Still looking new 2 months out of Erie, PA. Title: Up close and personnel shot of BNSF 6392 crew as they roll west out of BNSF Hauser yard towards Spokane, WA with a loaded coal. Title: BNSF6392 an ES44AC leads a coal empty out of BNSF Vancouver Yard. Description: These had just taken off from the Kansas Power and Light plant on the west side of Lawrence and were heading back to KC before heading back west. 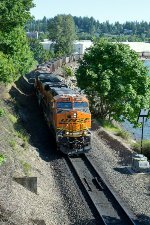 Title: BNSF 6392 leads a wb coverd hopper train. Description: Yet another Q train heads east at 1427.